Like its companions, West Aegean and East Aegean, Ionian contains detailed information on many of the smaller harbours and anchorages which cannot be covered as comprehensively in Rod Heikell's major guide, Greek Waters Pilot. These handy cruising companions are ideal for charterers and flotilla sailors who are in the area for a short time but to make the best of it need all the essential background information on places to visit, history, food and travelling in Greece at their fingertips. Cruisers on their own yachts will also find much of interest and additional pilotage when cruising in the area. Ionian covers the coasts and islands south from Corfu, southwards to Finakounda and eastwards to Mesolongion. 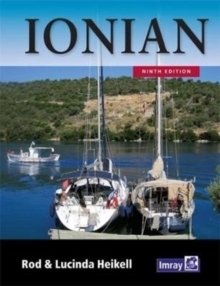 Ionian is essential on-board reference. This new 9th edition has been revised thoroughly throughout. The authors have updated the text and plans, and added lively new photographs. 'Heikell's style is easy to digest and gives pleasure in the details of the history, geography and social circumstances of the places described as well as the essential sailing information.' The Little Ship'This book, as well as being a practical manual on Ionian cruising, seems to have absorbed much of the author's personal feelings regarding the charm which draws him back to it, and any reader who has had a whiff of the magic spell of the Greek islands will sense this, and inevitably renew the resolve to return and experience it once again in greater measure.' Nautical Magazine'Rod Heikell nowadays is to the Mediterranean as gin is to tonic. It is difficult to imagine sailing there without one of his guides. Clear pilot notes, chartlets and plentiful illustrations, with entertaining commentaries on each place. Up-to-date observations on local and national regulations.